Notice: Welcome to Al-AMAL INSTITUTE FOR ORPHANS. In spite of all he has been through, nothing hurts Yousif al-Shimbari more than getting used to mornings without hearing his mother’s voice. During Israel’s assault on Gaza in 2014, the 14-year-old and his family sought refuge from their Beit Hanoun neighborhood in the northern Gaza Strip to a UN-run school in the area, thinking themselves protected by its blue flags and logos. They were not. On 24 July, two weeks into the onslaught, Israeli shells slammed into the school, killing at least 15 and wounding scores. Among the fatalities were Yousif’s mother. Among the wounded, he and his sister. Manar, 15, underwent surgery. She had both legs amputated. Yousif and Manar now live in Al-Amal Institute for Orphans in Gaza City, formed in 1949, the only institution devoted to the care of orphaned children in the coastal enclave. The institute is their only option, Yousif said, with relatives unable to help out all 11 siblings. “We are scattered. Some of my sisters live with relatives and it is not very often that we meet,” he told The Electronic Intifada. He attends a nearby school, but playing football with his roommates from the institute is the best part of his day. He is ambitious but says he is not sure about what will happen in the future. “I love mathematics and I wish to become an engineer one day like my father,” he said. Yousif’s father died of natural causes seven years ago. Yousif and Manar are just two of 40 children at Al-Amal who lost one or both of their parents during the 2014 Israeli onslaught. They joined another 90 children housed there before the attack and the institute’s budget is strained to bursting point. In all, 52 children at Al-Amal have lost both parents and all have lost their fathers, the principal breadwinners. In Arabic, an “orphan” includes those who have lost one or both parents. 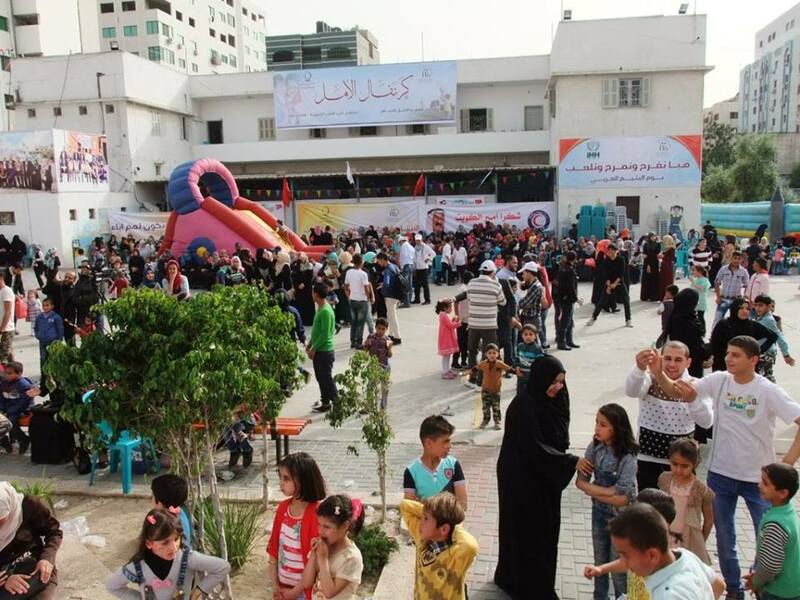 Iyad al-Masri, Al-Amal’s executive director, told The Electronic Intifada that the institute follows strict criteria for selecting only the neediest orphans to be accommodated. “The lack of funding constrains us,” he said. Staff meticulously scrutinize data to discern whether it is better for a child to stay at the institute, and if he or she has absolutely no other safe place to go. Only then does the administration contact relatives to offer shelter. Local individual sponsors and foreign charity groups provide the bulk of the institute’s funding covering operational expenses and services that include education, healthcare and entertainment. But as the number of orphans hosted has risen, meeting those needs is proving more challenging than before. Three successive Israeli military onslaughts in less than six years have caused a marked increase in the number of orphans in the embattled and isolated strip of land. According to Itimad al-Tarshawi, an official at Gaza’s Social Affairs Ministry, of Gaza’s 15,223 orphans, 3,366 lost parents to Israeli aggression. “Two thousand children lost their fathers or mothers or both in the 2014 summer aggression alone,” she noted. Al-Tarshawi voiced her concern over the inadequate care provided to orphans resulting from the lack of resources. Gazan orphans should get free education, full health insurance and protection, but none of that can be guaranteed in the desperate financial situation in Gaza. She appealed to the international community to step in. “It is totally unacceptable to leave these children in such terrible living conditions, all of which have resulted from a 10-year-old blockade driven by unjust political agendas,” al-Tarshawi said. But a lack of money is not the only problem confronting Gaza’s orphans. Khaled Tuman, the mental health worker at Al-Amal, told The Electronic Intifada that the orphans face a number of psychological issues, particularly the newcomers. The fact that all the children come from different backgrounds is also challenging to both children and the administration. Disagreements, fights and conflict can emerge, and supervisors are always alert to negotiate all the different kinds of issues that may arise with and between the boys. Some recreational activities can be helpful in this respect, and staff find such techniques useful to help children assimilate fully. The unusual circumstances of life at Al-Amal has not meant that the children who come out of it are not successful or equipped to pursue ambition in their lives. On the contrary: the opportunity to restore some faith and confidence after bitter childhoods often spurs them on. Bashar Abu Quraya’s name trips easily off staff tongues. His is an example they often wheel out for the children there. Abu Quraya, who spent 10 years at Al-Amal, achieved a very high score in the tawjihi, the high school examination. He is now studying medicine in Turkey. Luck plays its part. Unnamed philanthropists are helping him financially. But it is his own perseverance that has enabled him to even get to a position close to fulfilling his dream of becoming a doctor. The number of children living at the al-Amal Institute for Orphans has nearly doubled since the 2014 war. Copyright. All rights reserved to Al-AMAL INSTITUTE FOR ORPHANS 2016.